It's well-known among my friends that I have an affection for things that are old, kitschy, and weird, particularly when they relate to gender roles and pop culture. Heck, it's well-known by the readers of this blog - I wrote about this topic just last month. What you might not know is that a semi-regular event at Comicazi is a board game night with the slightly unwieldy moniker "Super Happy Fun Game Night." (Don't ask.) And recently my friend Gary came across a board game that he knew would be right up my alley. He bought it for me, and when he presented it he had one stipulation - that we would play it at the next Super Happy Fun. I readily agreed and true to my word, brought it along to the last game night. The name of this gem? "What Shall I Be? The Exciting Game for Career Girls." 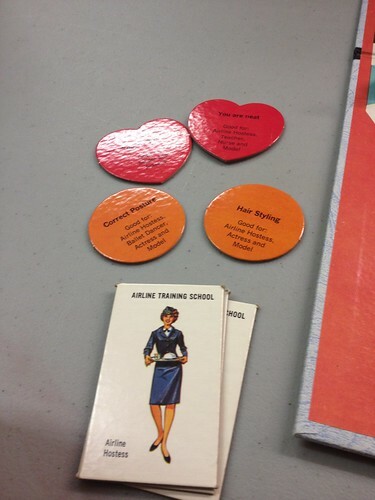 The game dated back to the 1960's, so I had a sneaking suspicion that the "careers" for girls wouldn't be quite the same as the ones we'd see in a game made today - or that most of the women I know actually hold. "What Shall I Be?" did not disappoint in this regard - if anything, it was an even bleaker picture than I'd imagined. This naturally made it much more fun to play, albeit in a slightly horrifying way - the actual game mechanics aren't terribly exciting, but the dated expectations of women and the fact that two of the players were actually men made the results hilarious. 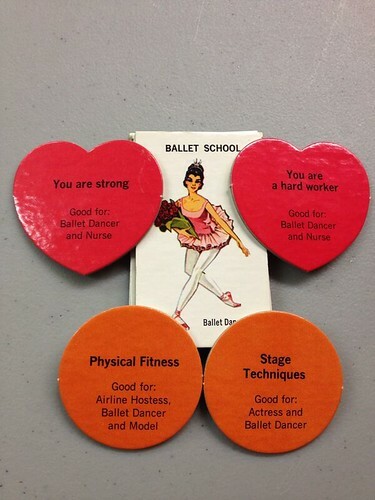 There are six careers a gal can aspire to - teacher, nurse, airline hostess, actress, model, or ballerina. Yes, girls, exactly one-sixth of you have a reasonable expectation of being a ballerina someday. Ballet is the cornerstone of our economy. School Cards - like the one pictured above. You need four of the same one to win, corresponding to your exciting career. Teachers go to college. Nurses go, predictably, to nursing school. Models, somewhat inexplicably, matriculate in charm school. You get the idea. 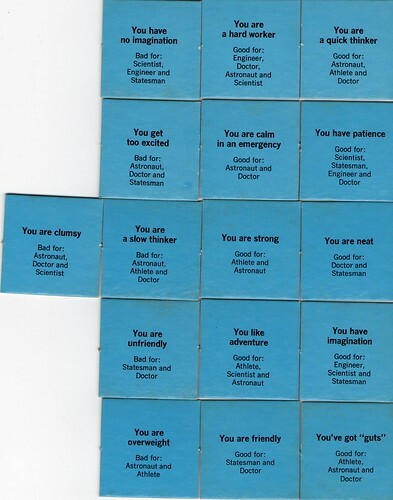 Personality Cards - pictured below. 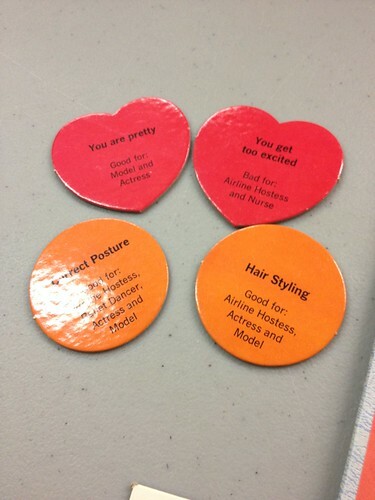 These ones shaped like hearts, and you need to get two that match your chosen career to win. They can be positive or detrimental and include important traits like "pretty" and "thin," because everyone knows that looks are the cornerstone of a good career! (Of course, if your career choices include model and actress, I suppose that's true. 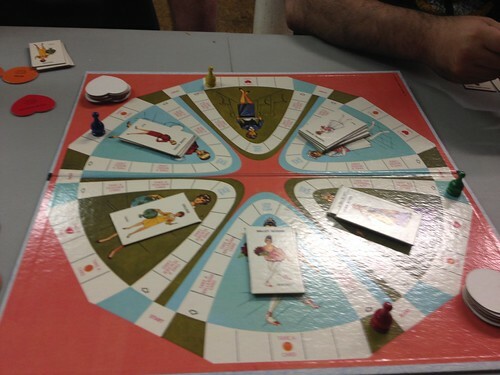 Finally, as pictured above, you need the round orange Subject Cards, two of 'em, to finish your win. These are things you are good at and important to your career, like how well you put on make-up, or things that can work against you, like being bad at styling your hair. You need to match these to your career to win, because if there's one thing we know, it's that models definitely do their own hair and make up. As you've probably figured out by now, most of the careers require you to be thin, pretty, and good with your makeup (though not necessarily the ballerina, as we will soon see.) Sure, teacher or nurse have some token "Good at Biology" or "Stays calm" cards, but for the most part, good looks and style are what it takes to get ahead in life in this game - clumsy, zaftig ladies with no make-up need not apply. After a protracted battle in which I attempted (successfully!) to crush Gary's dream of becoming an airline hostess, a clear victor finally emerged - our own Tiny Doom gathered the necessary cards to become a ballerina! I guess we'll have to call her Tiny Dancer from now on. She deliberately chose to avoid any of the grace and beauty cards, resulting a ballerina who is strong, a hard-worker, fit and well-trained - essentially the perfect ballerina straight out of the USSR. Brava, Tiny Doom! In case you were curious, YES, there IS a version for boys, and no, somehow, "handsome" was forgotten as a necessary trait for a job. Gary was intrigued enough to track down this one as well, so perhaps we'll play again and try for something a little different. Lest you be concerned, yes, I am aware that these are just board games, and that they're very old and not necessarily reflective of how a game like this would look now. Yet I think it's important, as we gender segregate our Legos and continue to get "boy" or "girl" toys with our fast food, to think about the impact that play has on how kids perceive themselves. Games like "What Shall I Be?" are just play, but in some ways, how we play is practice for how and who we're going to be in real life. I'm glad we've gotten away from anything as blatant as this, but I worry, at times, that we're slipping back. Agree? Disagree? Tell me all about it in the comments!